The organizers of the Good Friday Road Races, The Burlington Road Runners, are trying something different for the 43rd edition. The long-standing 5 km race distance along with the kids’ 1 km ‘bunny hop’ remain intact. However, the final race of the morning will now be 10 km as opposed to the traditional 10 miler. Those who have run the 10-mile course in the past know that it was a 5-mile loop completed twice. The new 10 km course will now utilize a double circuit of the long established 5 km route. 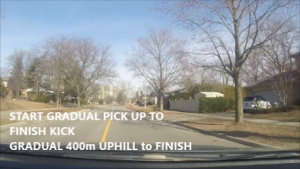 Use this Good Friday Road Races 5KM Course Preview to help you achieve your best on race day! Aldershot Secondary School at roughly the second entrance to a town house complex on the south side of Fairwood Place West. After you have found your appropriate starting position amongst the masses make sure you are facing east (towards Aldershot Secondary School) otherwise you are in for a world of hurt when the gun goes off with many unsympathetic passersby! To borrow a couple of constellation terms the opening kilometre of the Good Friday race course consists of both a “little dipper” and a “big dipper”. The little dipper happens almost immediately in your opening paces as you accelerate away from the starting mats while jostling for a favourable position. A gentle down slope towards the high school – and what will be the finish line, but not for another three miles (sorry!) – is then followed by a gentle climb to Park Avenue West where you will make your first turn and make sure it’s a right! You will follow Park Avenue West through to the bend leading to Lasalle Park Road where you will be making two right turns in quick succession: one to get onto Lasalle Park Road and another to head west along North Shore Boulevard West where you will be “greeted” with the most challenging part of the course. As you enter North Shore Boulevard West those of you who have run the Around the Bay 30 km will undoubtedly recognize the next roughly two kilometres of this course, as it is common to both. You have now commenced the big “dipper portion” of the Good Friday racecourse with a rather pronounced decline. This downhill is sharp enough that you want to exercise caution and prevent your legs from getting away from you thus expelling too much energy early on from undue pounding onto the pavement. As the downhill levels out you will past the 1 km marker and start trudging up the sharp and relatively long ascent for then next 400 metres. This is what is often described as this the “scenic” part of a course in many a race brochures. At approximately Fairwood Place West (first road on your right) the terrain levels out, but this next 800 m along North Shore Boulevard I would characterize as a very subtle false flat, meaning there is an ever-so-slight incline to this stretch of the course. Somewhere between Easterbrook and Unsworth Avenues at the Waterfront Trail sign on your right you should see a marker indicating 2 km. Put this landmark in your memory bank as it will be important later on! 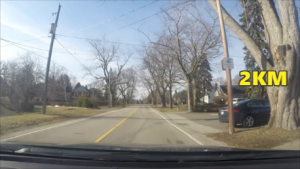 Just past Gorton Avenue, North Shore Boulevard snakes down, around and up as it heads northward and you will take your first available left at Hendrie Avenue and exit quickly by way of your first right onto Danforth Avenue. When you reach the end of Danforth Avenue and turn right onto Plains Road West two points of congratulations are in order. One, you will soon be greeted by the 3 km marker, thus you are now heading back “home.” And two, all the hard parts of the course are done! Every step you make from here on in is on either flat terrain or has a gentle downward slope like the stretch heading south along the length of Unsworth Avenue. After you have made the left back onto North Shore Boulevard West and heading east recall your earlier instruction to remember the two-kilometre marker between Easterbrook and Unsworth Avenue. Essentially at this same very spot you will now have to commence preparations for that drive for home as you have just 1 km to go! Between Unsworth Avenue and the finish line at Aldershot Secondary School you will have ample time to start lengthening that stride and quickening your cadence with only the left turn onto Fairwood Place West the single disruption in what is ultimately a one kilometre straightaway for home. When you reach the turn at Fairwood Place if you haven’t already commenced your kick to the finish line now is the time as you only have 400 metres left! 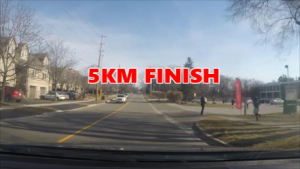 (2nd Lap for all 10KM runners) If you reach Fairwood Place and this whole experience has been pure agony from the moment the starter’s pistol went off, fear not, as you only have 400 metres left. Starting your finishing kick before you can see the actual finish line on this gradual uphill section can typically help you pass other runners who are not as prepared. As you approach the finish you will hear the crowd cheering louder with 150m to go there is no use saving any energy now! Give it all you got! The last 50 metres is the same short quick downhill you experienced at the start but this time down into the finish! If you are running the 10KM event then the first time you turn onto Fairwood remember to continue as normal because your only about half way through your race. Start your finishing kick on Lap 2. You will pass to the left of the Finishing Banner as you start Lap 2. You still have 5 km to go! In the words of Nelson Muntz, “Ha-Ha!” Keep focused as you trek through this tough first 1500m again. The advantage of a 2 lap course is you know it well on the 2nd lap and just need to stay focused one step at a time. The finishing kick should be just as described above and your done! The Leaderboard for anyone who has run the course using Map My Run. Import your data from race day after running the course for it to appear.